and the quilt is delivered. The colours are bright…and the detail is a bit hidden in the colours. There are little paw prints in the borders – you can see them in this post. 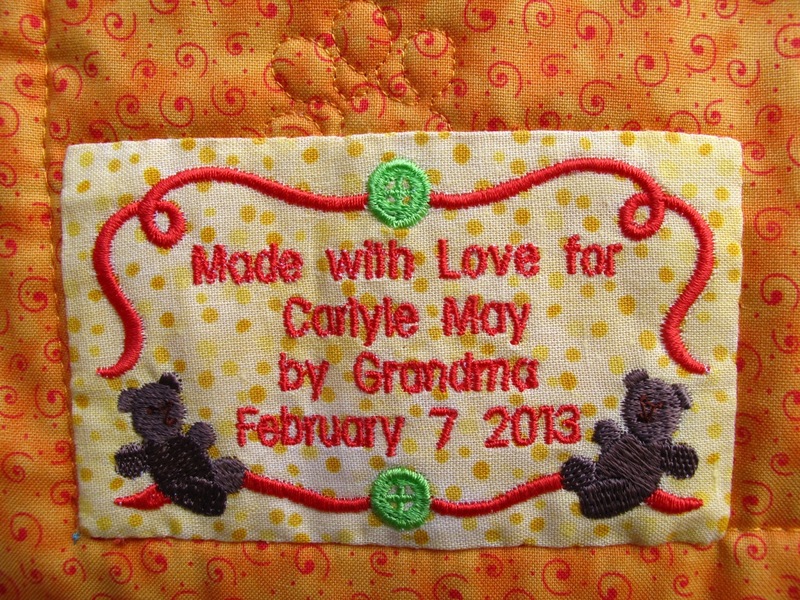 I loved putting the label together for our little granddaughter. From July 13, 2016 – a post by Wendy. Rachel loves to visit me in my sewing room. She loves the room for many reasons. 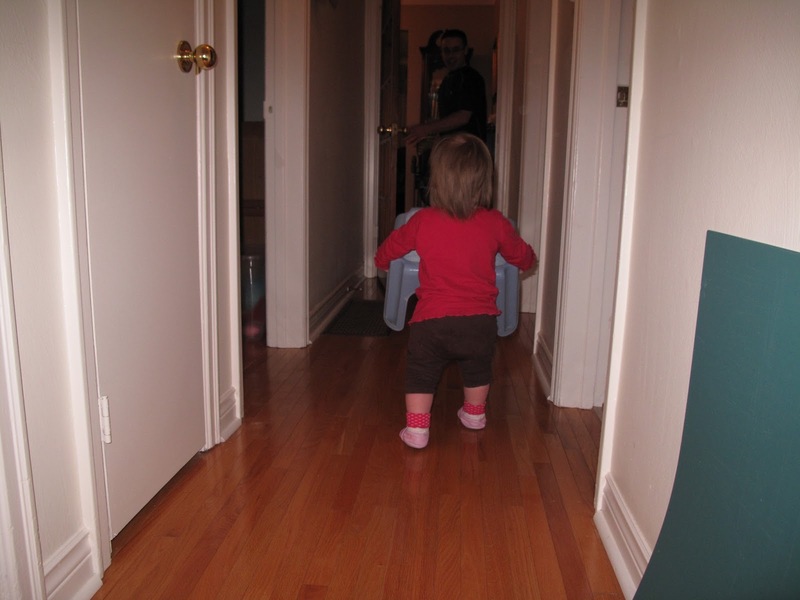 I have a small blue stool in there that she can sit on…or carry off to another room to climb up on furniture! She loves that there are many colourful things in the room. I always enjoy her finding me in there, but sometimes I think it’s all about the blue stool. When I have the door closed whil e working on a project I often hear her knocking on the door to see if I will let her in with me. In the photos you can see that one night I let her in when it was safe. Whatever the reason I usually love her to be around. 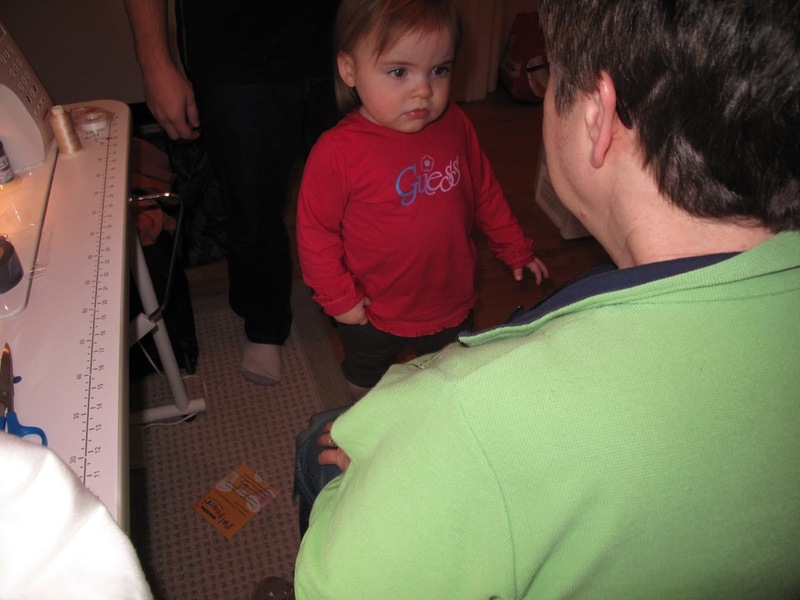 I loved being around my Grandmother and I learned many things that stand me in good stead today from her. Maybe one day I will be able to teach Rachel to quilt. For the time being I’ll be glad to see her in my sewing room even if it is to get the blue stool. Another post from the past. This is from Wendy’s pen and tells of her beginning in quilting. I’ve always liked working with my hands. Always liked creating something that was nice to look at and had good function. 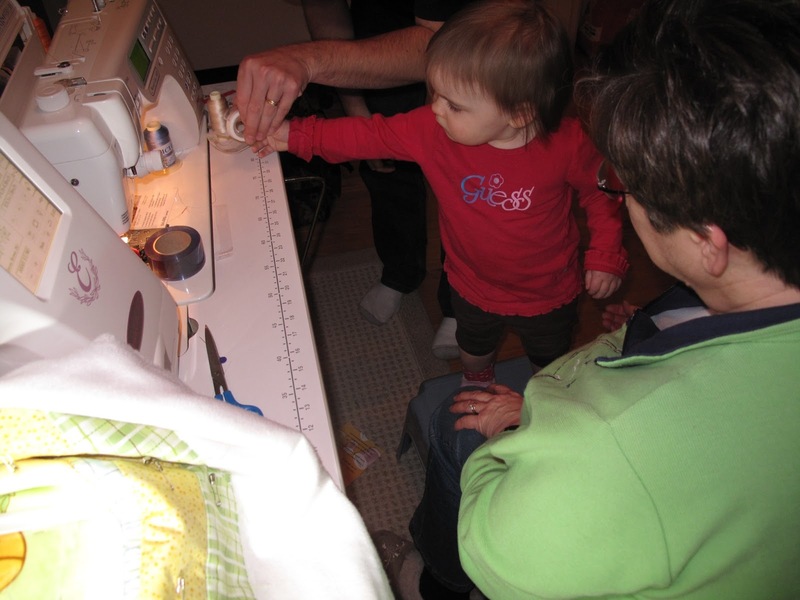 In High School, I was taught to sew clothes…with some success! But I didn’t find much joy in it. It was more frustrating than fulfilling. So having a sewing machine is something I’ve always had. When we came to Alberta I was looking for a hobby and as we explored Calgary I stumbled across a quilt store by the name of Quilter’s Cabin. The name intrigued me so I went in… I was hooked. The quilts were beautiful, there were wall hangings, placemats, table runners, lap quilts, there was more than just warm coverings for a bed. They were works of art. This seemed like something I would enjoy. Quilter’s Cabin was offering classes and so it seemed a good starting point to sign up. I hauled out my old Kenmore machine and headed for my first lesson. I’ll leave the story of that class for another post, but let’s say they weren’t impressed with my machine. However I did get this first quilt made and I was proud to piece it, put the batting and backing together and then complete the binding to finish it off. 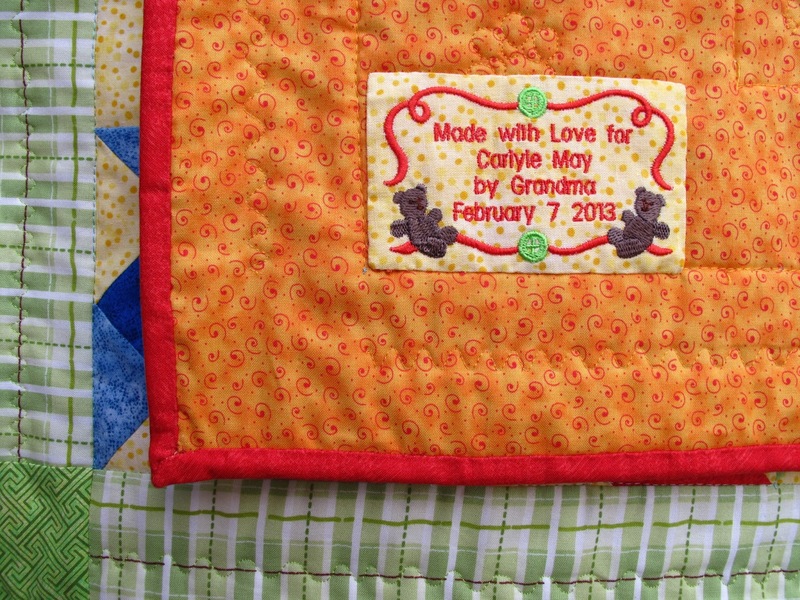 It’s a basic quilt – the purpose of this class was to learn the basics of quilting. If you are going to quilt you need to know how to use the rotary cutter (bought my first one on clearance at Michaels! ), acrylic rulers, understanding a quarter inch seam and building the blocks! 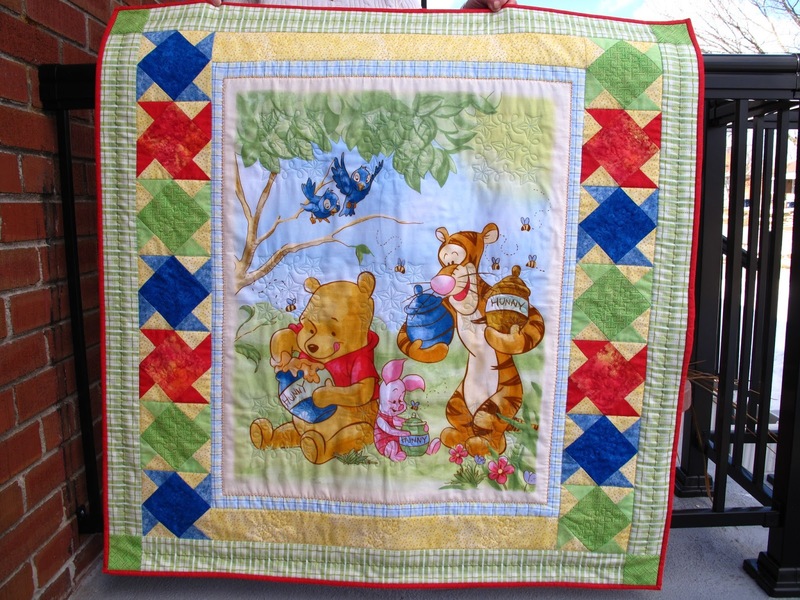 Quilting includes reading and understanding the pattern, being able to choose appropriate colours and fabrics, and knowing how much to purchase. 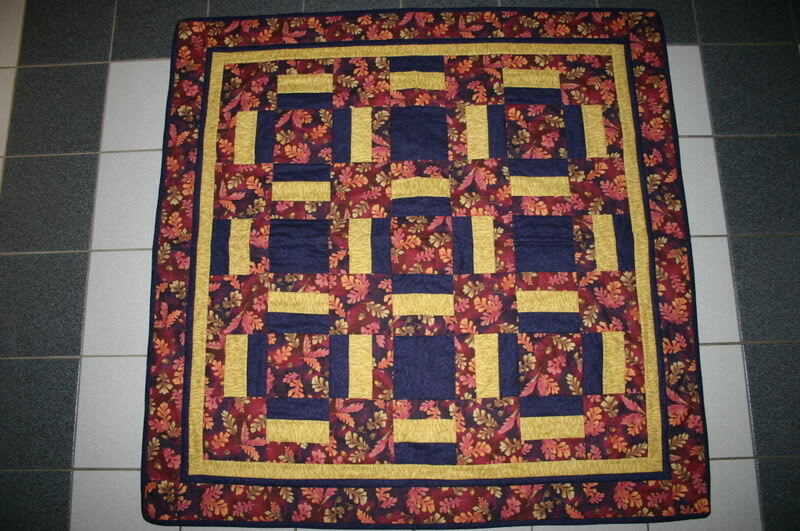 Quilter’s Cabin no longer exists but that’s where I got my start and this was my first creation. The feeling of satisfaction that comes from seeing this from beginning to end is wonderful.